the "23.976 Frames/Sec" is the frames per second property of your AVI/DivX file. 23.976 == NTSC Film ; 25 == PAL ; 29.97 == NTSC. Start Nero Burning ROM 5.5 and start a new "VideoCD" compilation. Now you'll need to choose PAL or NTSC mode, depending on your existing AVI/DivX file. Press the "New" button to start the new compilation. Once you have finished dragging in your videos (you can drag in about 70 minutes of video per 650 MB CD), from the "File" menu, select "Write CD". Feel free to change some of the CD writing options (such as Lable, writing speed ...), and click on the "Write" button when you are finished. Most DivX movies come with MP3 or WMA audio compression. Unfortunately, most of the AVI to MPEG-1 conversion tools do not support compressed audio, so the only way to convert DivX to MPEG-1 with audio is to decompress the audio first. 1. Load your DivX/AVI file into VirtualDUB. 2. From the "Video" menu, select "Direct Stream Copy". 3. From the "Audio" menu, select "Full Processing Mode". 4. From the "Audio" menu, select "Compression" and choose "No Compression (PCM)". 5. Save the AVI file - your new AVI file should have non-compressed audio. The problem with this is that the AVI file can get really big, and may exceed the 2 GB AVI file size barrier - in this case, you should extract the audio of the AVI file to a WAV file instead (see below). 2. From the "Audio" menu, select "Full Processing Mode". 3. From the "Audio" menu, select "Compression" and choose "No Compression (PCM)". 4. From the "File" menu, select "Save WAV". Start XingMPEG Encoder and select to open a new job. Change "Stream Type" to "System"
If you choose the extract the audio of the AVI file to a WAV file, in the "Audio Filename" section, load the uncompressed WAV file you made before. Otherwise, leave this section alone. In the "Target Filename" section, choose the location/filename of your final converted MPEG-1 file. Your JOB file has now been created - you can press "Encode" at any time to start the encoding. A preview windows on the right will display the video currentl being converted. You can press the "Pause" button at any time to abort the encoding - I suggest you test the conversion by converting a small section first, and then pressing "Pause" to abort the encoding - test the output file to see if it is playable and whether the sound is in sync or not. To cut MPG files, all you need to do is to load the MPEG file into this program. In the "footage" window, drag the clip into the "player" window. Go to the "preferences" menu, and change the option to "VideoCD" in the "VideoCD Mode" section. Now use the "mark in" (where the clip starts) and "mark out" (where the clip ends) buttons (bottom left of the Player window) to select the first part of the movie you want to cut (I suggest cutting the first half of the movie) - please take note of the hour:minutes:seconds that your clip ends at. The, go to the "edit" menu and select "record" - the clip you want to cut should now be in the "record" window. Highlight the "record" window and save the clip by going to the "file" menu and selecting "save as". Repeat this for the second half of the movie, making sure you "mark in" at the right spot. 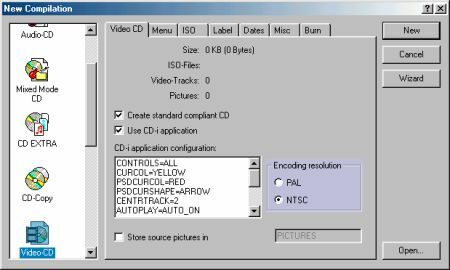 Once you have a converted VCD compliant MPEG-1 file, you can use a Video-CD compatible CD-R software to burn a VCD. Now follow the steps in this guide to burn your VCD compliant MPG file as a VideoCD.